Capture Email Addresses On The Go | Brand On! Do you run any special events IRL? How would you like a way to capture more email signups during your events? Chimpadeedoo will do the trick. Chimpadeedoo is from the fine folks at Mailchimp. It lets you collects email addresses and store them on your iPad or Android tablet, even when you’re offline. Whenever you connect to the web, it will automatically add the addresses to your MailChimp list. You can start with one of their background themes, or add your own background and logo. 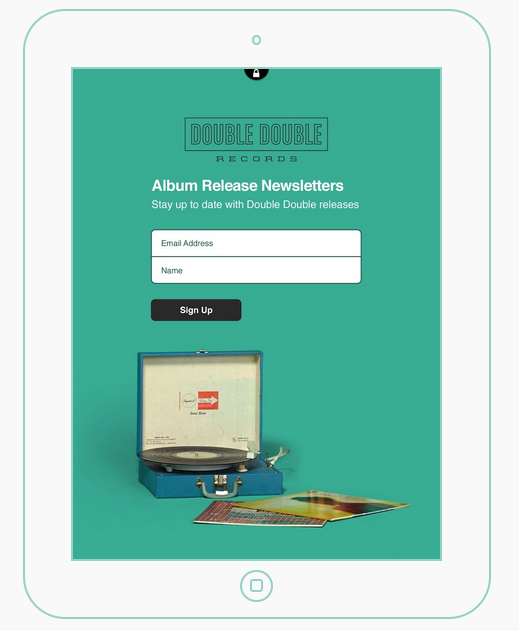 Next, pick a font and button style, write your copy and connect the form to any MailChimp list. My friend Nathan Richie of NR Creative Group can hook you up with one of these kiosks for about $600-$800! Cost: Chimpadeedoo is a free app for iPhone/iPad and Android (it also requires a Mailchimp account…BTW, I use Mailchimp, and it’s been free for me for over a year).